^ a b c "An Autobiography of Religious Development". 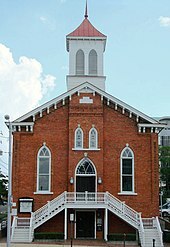 The Martin Luther King Jr. Research and Education Institute. Stanford University. Archived from the original on 2014-12-18. Retrieved November 15, 2018. ^ Baldwin, Lewis V. (1991). There is a Balm in Gilead: The Cultural Roots of Martin Luther King, Jr. Minneapolis: Fortress Publishing. pp. 281–282. ISBN 0-8006-2457-2. Retrieved 5 July 2018. ^ Baldwin, Lewis V. (1991). There is a Balm in Gilead: The Cultural Roots of Martin Luther King, Jr. Minneapolis: Fortress Publishing. p. 167. ISBN 0-8006-2457-2. Retrieved 5 July 2018. ^ Walsh, Frank (2003). The Montgomery Bus Boycott. Gareth Stevens. p. 24. ISBN 0-8368-5403-9. ^ Schlesinger Jr., Arthur M. (2002) . Robert Kennedy and His Times. Houghton Mifflin Books. p. 351. ISBN 0-618-21928-5. ^ Schlesinger Jr., Arthur M. (2002) . Robert Kennedy and His Times. Houghton Mifflin Books. pp. 350, 351. ISBN 0-618-21928-5. ^ Democracy Now!. 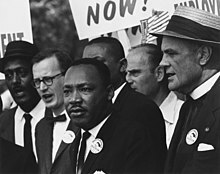 Rare Video Footage of Historic Alabama 1965 Civil Rights Marches, MLK's Famous Montgomery Speech. Retrieved 2018-05-05. ^ Martin Luther King Jr (2015). Cornel West, ed. The Radical King. Beacon Press. ISBN 0-8070-1282-3. ^ a b Kurlansky, Mark (2004). 1968. Jonathan Cape (Random House). p. 46. ISBN 0-224-06251-4. ^ Davis, Townsend (1998). 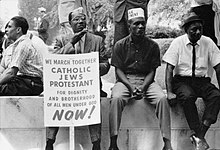 Weary Feet, Rested Souls: A Guided History of the Civil Rights Movement. W. W. Norton & Company. p. 364. ISBN 0-393-31819-2. ^ Montefiore, Simon Sebag (2006). Speeches that Changed the World: The Stories and Transcripts of the Moments that Made History. Quercus. p. 155. ISBN 1-905204-16-7. ^ "Statue unveiled in honour of Martin Luther King Jr". 13 November 2017. ^ "New name for Newcastle University's Student Union Mensbar revealed". 11 March 2017. ^ Perry, L. (1973). Radical Abolitionism: Anarchy and the Government of God in Antislavery Thought. University of Tennessee Press. p. 4. ISBN 978-0-87049-899-2. ^ Ross, Gyasi (January 11, 2018). 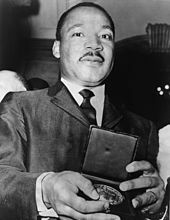 "Dr. Martin Luther King, Jr., Black People and Indigenous People: How We Cash This Damn Check". Huffington Post. Huffington Post. Retrieved 25 November 2018. ^ a b c d e f Bender, Albert (February 13, 2014). "Dr. King spoke out against the genocide of Native Americans". People's World. People's World. Retrieved 25 November 2018. ^ a b Garcia, Kevin (December 1, 2014). "The American Indian Civil Rights Movement: A case study in Civil Society Protest". Yesterday and Today. 12: 60–74. ISSN 2309-9003. Retrieved 25 November 2018. ^ a b c d e f Leighton, David (Apr 2, 2017). 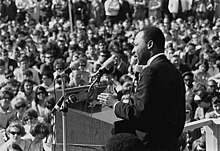 "Street Smarts: MLK Jr. visited 'Papago' reservation near Tucson, was fascinated". The Arizona Daily Star. The Arizona Daily Star. Retrieved 26 November 2018. ^ Pineo, Christopher (January 21, 2016). "Navajos and locals in Gallup celebrate Martin Luther King Jr. Day". Navajo Times. Navajo Times. Retrieved 26 November 2018. ^ Cook, Roy. 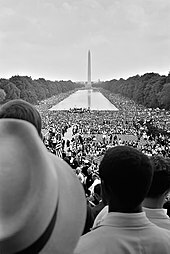 "'I have a dream for all God's children,' Martin Luther King Jr. Day". American Indian Source. Retrieved 25 November 2018. ^ Oates, Stephen B. (December 13, 1993). Let the Trumpet Sound: A Life of Martin Luther King, Jr. HarperCollins. p. 159. ISBN 978-0-06-092473-7. ^ King, Martin Luther Jr. (2000). Carson, Clayborne; Holloran, Peter; Luker, Ralph; Russell, Penny A., eds. 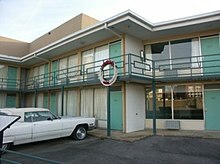 The Papers of Martin Luther King, Jr: Symbol of the Movement, January 1957 – December 1958. University of California Press. p. 364. ISBN 978-0-520-22231-1. ^ King, Martin Luther Jr. (2000). Carson, Clayborne; Holloran, Peter; Luker, Ralph; Russell, Penny A., eds. 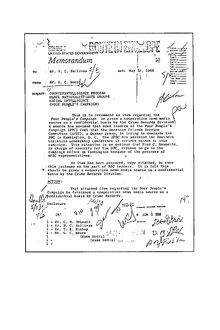 The Papers of Martin Luther King, Jr: Symbol of the Movement, January 1957 – December 1958. University of California Press. p. 84. ISBN 978-0-520-22231-1. 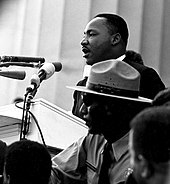 ^ King, Martin Luther Jr. (1992). Carson, Clayborne; Holloran, Peter; Luker, Ralph; Russell, Penny A., eds. 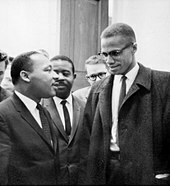 The papers of Martin Luther King Jr. University of California Press. p. 384. ISBN 978-0-520-07951-9. ^ "Quotes". worldpopulationbalance.org. Retrieved 9 July 2014. ^ Garrow, David J. 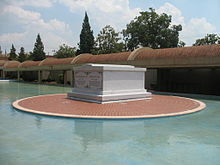 (July–August 2002). "The FBI and Martin Luther King". The Atlantic Monthly. ^ "Did You Know That Martin Luther King Won A GRAMMY?". GRAMMY.com. 2019-01-17. Retrieved 2019-01-21. King, Martin Luther Jr. (1998). Carson, Clayborne, ed. Autobiography. Warner Books. ISBN 0-446-52412-3. King, Martin Luther Jr. (1992). 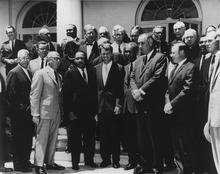 Carson, Clayborne; Luker, Ralph E.; Russell, Penny A.; Harlan, Louis R., eds. 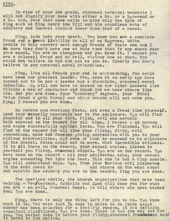 The Papers of Martin Luther King, Jr., Volume I: Called to Serve, January 1929–June 1951. University of California Press. ISBN 0-520-07950-7. 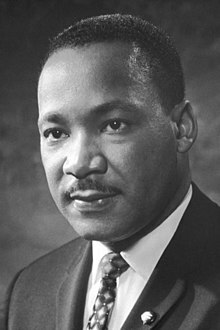 King, Martin Luther Jr. (2015). Cornel West, ed. The Radical King. Beacon Press. ISBN 0-8070-1282-3. This page was last edited on 18 April 2019, at 18:14 (UTC).